Enjoy this Pompeii day trip from Rome by starting with a visit to the volcano that started it all. Mount Vesuvius’ infamous eruption in 79 A.D. wiped out the city of Pompeii and its 16,000 inhabitants in minutes. Today, with a history of eruptions throughout the centuries and its close proximity to a population of three million, the active volcano is considered one of the world’s most dangerous, yet beautiful attractions. Your private driver from Italy’s Best will pick you up from your accommodations and bring you to Mount Vesuvius and Pompeii. Though the city remained hidden underground until the 18th century, the volcanic ash preserved its buildings, streets, mosaics and frescoes, allowing Pompeii to remain intact—completely frozen in time as it was 2,000 years ago! Embark on your tour at Vesuvius National Park where you will explore the volcano itself with your own private English speaking volcano expert. You will have the chance of a lifetime to visit two areas that aren’t accessible to the public: the volcano’s summit, complete with an exquisite view of the Bay of Naples, and then the opportunity to venture inside the crater! 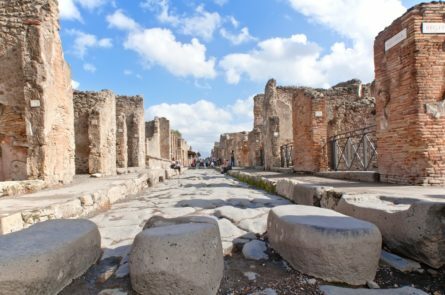 Next continue your Pompeii day trip with a ride along the coast to Pompeii, where your private guide will lead you through Pompeii’s archeological sites. See first-hand the remains from the calamitous eruption including the House of the Tragic Poet with its elaborate mosaic floors, the town Basilica and Temple of Apollo as well as the plaster casts of those killed during the eruption, their bodies captured in motion as they tried to outrun the lava. Leading you away from the crowds, your guide will show you some of the lesser-visited areas including the cemetery, the baths and a brothel. Following the tour, explore on your own or shop for souvenirs before meeting your driver and returning to your accommodations.